All your favorite pizzas, sides, drinks, desserts, and extras! 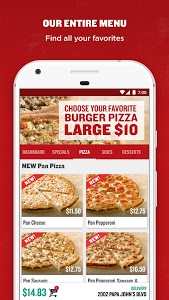 Special offers delivered to your mobile device. 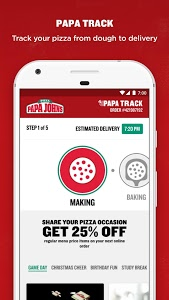 Track your pizza from dough to delivery and be notified when it’s on the way. 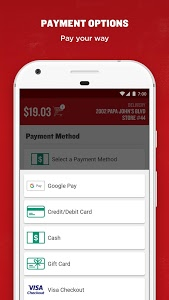 Google Pay, cash, credit card, Visa Checkout, PayShare, and most stores even take checks. Get offers and coupons from your neighborhood restaurant. or just click repeat for the last order. 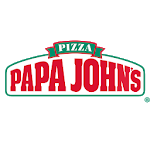 Improved mapping helps you find the closest Papa John’s location. 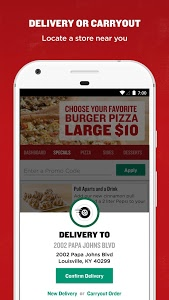 Order with or without a PapaJohns.com account. 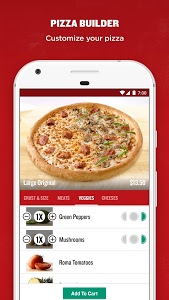 Change your location and order from any Papa John's in the USA. With Future Ordering, you can put together that order for lunch or this weekend’s party right now. Just want a large Pepperoni or Cheese pizza? We have you covered! For use at U.S. locations only. Have questions or comments about this app? Contact us. - Bug fixes for App crashes. Similar to "Papa John's Pizza"